Discussion in 'Football Recruiting' started by RB07OSU, Feb 7, 2019. Everything got a little disjointed with the early signing period and then the final signing day yesterday, but figured I would put my thoughts on this class in the typical BRPT review format (with a couple nuances and I am sure the BRPT will weigh in with their input once they get the chance) and everyone can chime in with your thoughts in the replies. The February signing day does not have the typical fireworks as it used to, but now is a great time to reflect on the class now that it is in the books. Justin Fields if you count him in the 2019 class I suppose, that is a huge get and he is going to start immediately. Of the true 2019 class, Garrett Wilson. Not only is GW extremely talented and a game breaker, he has a ton of polish to his game already and has the instincts of a receiver where I think he will adjust to the speed of the game at the next level quickly. Add on the fact that Garrett is a natural leader and willing blocker, and I think he has the chance to play right away under Hartline, who has shown he will play a guy if they are ready despite a talented WR room (see Chris Olave). If there is a runner up here, I would submit Harry Miller, who I think is college ready in terms of not just physicality and technique, but also brains...the kid is smart and picking up scheme mentally is the biggest thing for an OL to play early. Zach Harrison and it isn't even close. 6'5 245 lb. freak athlete that runs a legit 4.4 and has reach for days. Technique and consistency needs work but if he commits himself and gets the tutelage of LJ Sr., his potential is absolutely through the roof. I believe Zach is a RS candidate unless we use him in situational pass rush situations, but I think he can be an all-time great if the stars align. Runner up is Jameson Williams, who I couldn't be much higher on...shades of TGII in his game and he could be an absolute game breaker here, and early on imo if he puts on a few pounds and learns our scheme. Harry Miller. Incredibly intelligent kid, great leader, excellent physical tools, and he will put the time in to be successful here. I would be shocked if he didn't end up being a 3 year starter type with all conference/all american credentials. Runner up is Tommy Eichenberg, who I think is going to be a 3 year starter type that will be Mr. Consistency...one of the biggest commits in the 2019 class imo given the concerns at the LB position. Co-runner up is Noah Potter, who needs a shout out because I think he has too many physical tools, talent and drive to not thrive under LJ Sr.
Jameson Williams. Could certainly go with Harrison again here, but I think Jameson has some of the most upside in terms of athleticism and game-breaking speed I have seen from an offensive recruit we have brought in. Then he went and really impressed scouts at the UA All-American game with his polish and route running, which was a bit of a surprise. I think we are in for a treat here. I would throw out Ronnie Hickman as the runner up...he was more noticeable on the offensive side of the ball in HS, but he has all the tools to be a lockdown corner here...hopefully a Marshon Lattimore type if we are lucky, who also starred as an offensive player but translated that talented to the CB position. Dawand Jones. There are things to like and he could definitely end up being a force if he puts the work with Coach Mic and gets his technique down. But he was definitely a "Plan C" type of guy at the last hour after we saw the ships sail on numerous top targets. Don't get me wrong, was happy to get his commitment on NLOID after we missed on the others though. Runner up is Cormontae Hamilton. Hamilton is a steady blocker and given our sporadic usage of TE's in the passing game, perhaps he is the perfect guy to take at TE for that reason. But I don't really see him adding anything in the passing game and it seemed like we were just bound and determined to take a TE even though the 2019 TE class and our realistic targets was about as sparse as I have seen it. Marcus Crowley. Crowley went under the radar until having a MONSTER senior season, then he was pursued by most. He's a big back that runs hard and has a lot of talent. I think we got a big time steal here. My runner up would be Bryson Shaw, who I am VERY high on...kid has the athleticism of a safety and has the size and hits like a LB...extremely underrated imo. Enokk Vimahi. We go offer a highly rated kid from Hawaii in January past the early signing day and in one month, some how surpass USC and Oklahoma when USC had a sizeable lead and the distance advantage. Just an excellent job by Day on that one, I am still in shock. Then you have Justin Fields if we count him as 2019...there was some talk early on when he went into the transfer portal, but I really didn't expect him to jump on the transfer here so quickly without much of a fight from other schools. Jordan Battle and not even close. While his decommitment was expected even if Urban stayed, it was a big blow to lose a highly rated DB when that position was arguably the biggest position of need for this class..factor in that he switched to Bama and its no bueno. Mathis at QB is currently the runner up, although you take the Fields trade any day of the week. If we do not hang on to Nester come February, then my answer will change. You could also through out Darnell Wright, the nation's top offensive tackle that was a strong lean here and basically fell off the radar months ago. Update edit: I initially drafted this right after early signing day. Now it is definitely Nester. We really needed to hang on to him. Vimahi is a nice late pickup and would negate the Nester decommit if he doesn't take his mission early on. But if he does take the mission, then it does nothing for us really, as you might as well just focus on 2020 and 2021 to fill the gaps. I agree with many that Nester was playing poor competition and sliding, but he had the physical tools to step in and compete if he picked up the technique. I think Nester would be a redshirt and then would have been competing for a spot, and that stings to lose him at a critical position of need. We absolutely need Jonah Jackson as a transfer now, because the OL need is immediate. If we get Jackson, it may bridge the gap enough if we kill it in 2020. Cornerbacks. Hickman is a very solid get here, but we needed at least a couple corners in this class, maybe 3. Aside from any potential transfer (i.e. go all out on LaMont Wade), Devonshire is about the only way to somewhat rectify the numbers issue in 2019. Will need a huge 2020 haul at this position. OL is a close runner up. Adding Vimahi and Jones may help, but Jones is a ways off from contributing and Vimahi may do the mission. Originally had this drafted as the biggest needs in February, which was more interesting, as we had two commitments and the obvious answer is Vimahi. Excellent get at the last minute. Aloha! Not an "addition", but I think Day's promotion to HC was the best thing for the program with recruiting (and generally, just trying to keep it focused on recruiting for this article). He keeps familiarity and continuity with the program, and the recruits already know him. While there is no replacing UFM on the recruiting front, I think Day is a huge hit with recruits and especially on the offensive side. But what about the defensive side? I expect immediate and positive results from the Mattison and Washington hires...both are lights out recruiters and I am excited to see the recruiting results here. Many big 2020 prospects already have ties to both coaches and I think both will be big improvements over Schiano and Davis. I know there is some trepidation from some fans given the school they came from, but I see it as a steal from the state up north and especially on recruiting. As to Hafley, the NFL angle an experience is great and by all accounts, he was an excellent recruiter when he was coaching in college. Moreover, he can recruit NJ and the NE, which was my biggest concern in cutting Schiano loose from a recruiting perspective. If he can recruit NJ and the NE like he used to, I think this is a big upgrade (and frankly, an upgrade regardless given Grinch and Taver Johnson's recruiting shortfalls in 2019). Might as well take a look at 2020 with the 2019 class in the books. Personally, I see the 2020 class being a top 5 class unless the 2019 season is some sort of implosion. We are already off to a hot start on the WR class and will likely close out strong there. Jack Miller is a top notch talent at QB and I see him staying put and helping with our recruiting big time. Paris Johnson is a bookend LT and I also see him staying on board and if we keep Wypler, he is one of the best interior OL in the country. Biggest needs are DB and OL, which I think get addressed. At DB, we have a ton of top talent with OSU at the top of their list (Cavazos, McGlothern, Ricks, Ringo, etc.) and the potential for immediate PT will be attractive. At OL, we already have 2 of the best in Johnson and Wypler...then you have plenty of realistic, talented options in Corcoran, Wray, Rodgers, Hatchett, etc. )..long story short, I expect a very good OL class. There are quite a few highly rated 5* guys that I think we have a solid chance on that you have to be excited about. I fully expect a home run class in 2020. OhioState001, Smudger, muffler dragon and 21 others like this. This class was always going to be about Zach Harrison. When a generational talent is playing in your own backyard, you simply have to sign him. No excuses allowed. And Ryan Day did just that. Harrison makes this class special, and three additional five-star prospects (Garrett Wilson and Harry Miller as 2019 signees, plus Justin Fields as a 2019 transfer) give this class the kind of top-level talent that will be needed for a future national championship run. Now with all that being said, this class is very small and as such has plenty of holes, most notably at cornerback and offensive line. This group also has plenty of tweeners and reaches, which is a risky proposition in a class this small. I have a bad feeling that this class could end up resembling 2003 more than any other - a couple of superstars, a couple of solid players, and a whole lot of busts. Justin Fields will be the Day One starting quarterback, if eligible, but he's not technically a member of the Class of 2019. Zach Harrison has tons of upside (see below), but he's also very raw. Harry Miller is big, strong, smart, and fundamentally sound, but he arrives late and it's always tough for a true freshman to make an impact on the offensive line. Garrett Wilson enters a crowded wide receiver room that has plenty of potential but little proven production outside of K.J. Hill (who's more of an H-back anyway). Most of the other 2019 signees seem like special teamers or redshirt candidates for next season. So, Wilson by default. Zach Harrison. If he develops technique, motor, and desire, then he will be an all-time great. The kids has off-the-charts measurables: 4.47 forty and 38-inch vertical at 6-foot-5 and 243 pounds, but he needs to turn that raw athleticism into production on the gridiron. If I put on my scarlet-colored glasses, then I suddenly see all of the actual reaches listed above as being potential sleepers. Take your pick. I'll say Craig Young, who is a Darron Lee type speed linebacker in some alternate universe. How often does Ohio State offer a top national recruit a month before Signing Day? How often does Ohio State offer a kid from Hawaii? How often does a Hawaiian recruit visit central Ohio during the middle of winter? Basically never. But that's how Enokk Vimahi's recruitment went, and he surprised most everybody by signing with Ohio State over the much closer and much warmer Southern Cal. Sometimes late bets on long shots pay off. Jordan Battle and Kane Patterson were both committed to Ohio State at some point, and each would look good in scarlet and gray right about now. Sampson James was an early verbal who got the cold shoulder and ended up at Indiana, which sounds about right. Doug Nester is a loss according to the recruiting rankings (#106 on the 247 Composite), but I never saw him as either an offensive tackle nor an early contributor. I was never high on Dwan Mathis and couldn't understand the offer to him; essentially trading him for Justin Fields seems like the steal of the century. 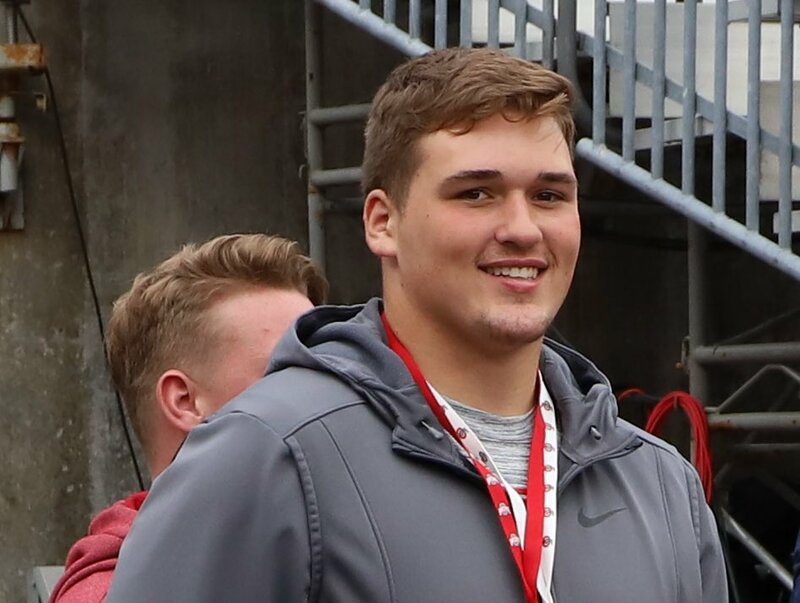 2019 was a very down year for Ohio high school talent, but the staff managed to let three of the top five in-state prospects get away, including much-needed offensive linemen Zeke Correll and Nolan Rumler to rivals (Notre Dame and Michigan, respectively). Ryan Day wants to make Ohio more of a focus for recruiting, so maybe we'll see less four-star whiffs in the future. Depth. There are a some very nice top-end prospects (Zach Harrison, Garrett Wilson, Harry Miller), and a lot of question marks (Cormontae Hamilton, Bryson Shaw, Steele Chambers, Ryan Jacoby, Noah Potter, Craig Young, Jaden McKenzie, Dawand Jones, Enokk Vimahi). What's missing are the guys in the middle, the solid four-stars who should be the foundation of the team. Yes, there's Cade Stover and Ronnie Hickman and Jameson Williams and Tommy Eichenberg, but most classes have a dozen of those guys plus the five-stars at the top and a few sleepers to round out the class. I can objectively state that Urban Meyer, Nick Saban, and Dabo Swinney have a positive impact on recruiting. Beyond those three, who really knows? Coaches may make a little difference around the edges, but the schools generally sell themselves. Ohio State could have the BPRT coaching the football team, and we'd be able to sign a top-25 class based on the facilities, the tradition, the campus, the student body, the academics, the City of Columbus, and most importantly the pipeline to the NFL. "Comfort and relationships" is bunk. Urban Meyer threw together a top-5 class two months after leaving the broadcast booth; Ryan Day signed three five-star prospects two weeks after being hired; Dwan Mathis flipped on Signing Day to a school that he'd never even visited; and two weeks later Mathis was replaced by the kid Mathis replaced. As far as personalities go, do you really think anyone actually likes Nick Saban? Much less Jim Harbaugh? Recruiting is full of strange bedfellows, shotgun marriages, and strained relationships, and it's only made worse by position coaches changing jobs every two or three years (sometimes to arch rivals). The current staff has lots of wind in their sails - they'll do just fine. This is the time of the year when we can dream about having the #1 class ... next year. Recruiting classes always look great on paper twelve months in advance of Signing Day. Right now, Ohio State's paper has Paris Johnson, Bryan Bresee, Luke Wypler, Julian Fleming, Kelee Ringo, Jack Miller, Gee Scott, Rakim Jarrett, Mekhail Sherman, Darrion Henry, Darvon Hubbard, Justin Rogers, Jaxon Smith-Njigba, R.J. Mickens, Jake Wray, Lejond Cavazos, Michael Drennen II, Fred Davis II, DeaMonte Trayanum, Jalen Berger, Dwight McGlothern, Turner Corcoran, Reece Atterberry, Geirean Hatchett, Miles Brooks, E.J. Smith.... A few of those names are in pen, lots are in pencil, some are in invisible ink. If Ohio State signs half of those guys, then the class of 2020 will be a great one. OSU_D/, Smudger, mendensa and 12 others like this. I just came in here to whine about you leaving Corey Linsley off of the #OCU list. akronbuck, RB07OSU, The Nameless One and 2 others like this. Great work to the both of you but @LordJeffBuck not sure how Noah Potter makes your list of question marks instead of "solid four stars"? Thanks for the write-ups guys, love them. Fields has been mentioned in this thread. And with “borderline free agency” on the horizon it’s probably appropriate to talk about transfers as a part of a recruiting class. If not in the main class thread then surely in the recap thread. Besides, the thread on the transfer portal is too broad. So, who has the goods on Jonah Jackson and what that timetable is? 247 sports had him as the #5 most important transfer (Fields was #1) and Jackson’s impact on the 2019/20 season could be enormous. Totally agree. This transfer portal/immediate eligibility trend has the potential to really negate some of these recruiting class rankings. Not that rankings are the be all end all in if u win a championship, but it's proven that better players give u a better shot and it gives u a decent idea of the sheer number of talented kids u have coming in. You bring in a kid like Fields, and 1 or more grad transfers or kids that are eligible right away, and that mid-teens class they just signed all of a sudden looks more like a top 5-10 class, especially filling needs right away that bringing in a freshman in a otherwise normal recruiting cycle may not be able to fill. I think they are still pursuing the All-ACC OL grad tranfer, Parker Braun, from GT as well. Haven't heard any recent news on Jonah. It makes sense to probably have a transfer portal thread where Ohio State targets are discussed. Whether that best belongs in the recruiting forum, Buckeye football forum, or general, I don't know. I'll run that by the higher ups. As to Jackson, his visit here went great but is visiting Oklahoma. I like our chances, but waiting to see how the OU visit goes. When is the visit to Norman? and when is the deadline for all these kids to decide their future schools? I mean technically, they have until fall camp starts when rosters have to be at 85, right? I don't think that has been determined, word was he would take the visit though. Imagine it will be soon. But ask and you shall receive, the OSU Transfer Portal Recruiting thread has been opened for discussion and stickied to the main page for the time being. Have at it folks. For graduate transfers, I am pretty sure they do have up until fall camp starts. Logistically, I would imagine most would decide no later than the end of spring to get acclimated, learn the system, and allow the coaches to figure out scholarship numbers.